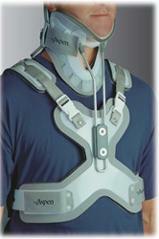 A cervical collar or neck brace is an important orthopedic device that has several possible uses for spinal health. The following list is intended to serve as a quick reference point for appropriate usage of cervical collars, but it is critical to consult with your physician when determining whether a cervical collar will be beneficial for your specific condition. Traumatic neck or head injuries including fracture and dislocation. A cervical collar can be administered by medical professionals after a serious neck injury in order to stabilize the cervical area of an injured person’s spinal cord and skull. In this instance, the brace reduces the likelihood of spinal damage and subsequent paralysis or even death. The collar stabilizes the top seven vertebrae (C1 through C7) until a medical diagnosis can ascertain whether or not a risk is present. Recovery. A cervical collar can also be used during recovery from a traumatic neck or head injury or after a spinal surgery. The patient may be advised to wear the device until they are fully healed. Whiplash and therapeutic usage. Cervical collarsare sometimes used to treat chronic medical conditions related to the neck and spine area, including realigning the spinal cord and treating whiplash and sprains. Whiplash is the result of injury to the soft tissues found around the cervical spine and is typically caused by hyperextension or sudden rotation. Whiplash is most commonly treated with a soft cervical collar, though current research shows that recovery time is accelerated when treatment also includes physical therapy and exercise. Cervical radiculopathy. Disk herniation, tumors, and certain traumas can lead to nerve root damage causing cervical radiculopathy. In the past this condition was often corrected with surgery, but recent studies have shown that it can be successfully treated with a combination of cold therapy, rest, exercise and the use of a hard cervical collar. Again, this is something to be addressed by a physician, specifically one that specializes in spines. Neck pain. Neck pain is a highly enigmatic condition because of the complexity of the nervous system. It is difficult to always identify root causes and is thus complicated to treat. While the use of cervical collars is not routinely used for pain management, they are occasionally used under the supervision of a physician. About the Author: MMAR Medical Group Inc. is a leading diabetic shoes and supplies supplier, including socks for diabetics and orthotic insoles.